If you want to create – and sell – online courses, you NEED an email list. You would send people to an optin page. Maybe you’d offer them an ebook, or a free download, or something like that. Is This The NEW Way To Build An Email List? He runs an online course business where he helps people with immigration issues. In Spanish. 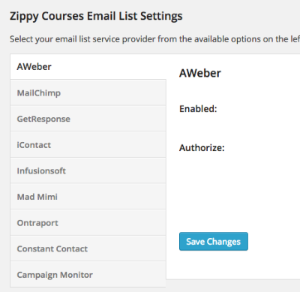 He used ZippyCourses to offer FREE online courses as a way to build his email list. And in his words: “the courses allowed me to add more than 1700 new subscribers” to my lists since I opened them. While most people offer ebooks, webinars, training series, you could offer an online course, with a private membership area, and can instantly stand out from your competition. With the new premium ZippyCourses theme, you get a new landing page template that makes this a cinch. (And remember: this new premium ZippyCourses theme comes with the deluxe package of ZippyCourses.). You can change the colors, the logo, the headline, and everything. So don’t worry about any of that. This is just an example of a clean landing page that’s pre-built into the new Zippy Courses premium Social Triggers theme. You can create this page JUST LIKE creating a regular wordpress page. Because when you hook ZippyCourses into your email service provider – we’re compatible with several of them – you can give away an online course for free, successfully building your email list and student base. Now of course these are STELLAR results. And they’re most definitely not typical. When you’re building an online course business, you OF COURSE, need to promote these courses. ZippyCourses is just a WordPress plugin. However, with this plugin, you can give away free online courses to build your email list. You could also then sell premium courses to people who grab your free online courses. Going forward, I plan on testing this new model for building an email list. And I’m happy that I learned it from one of the ZippyCourses users. Want to learn more about Zippy Courses? 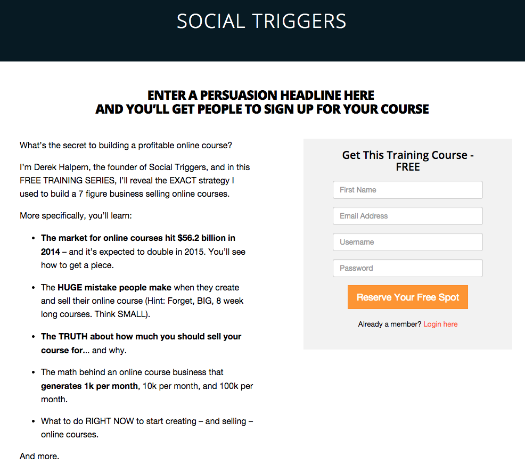 You can get the Social Triggers PREMIUM theme for ZippyCourses FOR FREE until Friday, March 27th. When you use the new Social Triggers theme, there’s something known as a “course directory.” This is where your students can see your existing online courses. …and they can also see the courses you have for sale too. I know I plan on testing this in the near future. Do you think this is the new way to build an email list? Glad to have something like ZippyCourses! I’ve been using the free ebook giveaway and still using it.. My subscribers base is pretty good even now but I’m preparing for a free course for my readers. Yup, that’s what I’m doing! LOVE Zippy, Derek. I’ve got 2 of my friends to switch from that other confusing, complicated stuff with 4 different integration plugins, and so many steps you feel like you’re climbing down into the depths of hell! 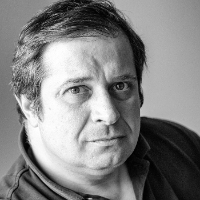 Free stuff now, and 2 stepped premium courses being created as I write….or when I stop writing. First time I have heard of Zippy courses to build a list. I’ve used Udemy to hold some of my courses, but Zippy looks a better prospect. Great post, Derek! Makes total sense to amp up the value of content given away. Love it! I would like to try Zippy Courses but I am a color vampire. Must.have.color. Do either of the themes have the capacity for more color and customization? I know you are more about content than design. I am about both :-). I JUST finished installing (or rather paying someone to install and set-up) Optimize Membership plugin for my blogging course. I am afraid I don’t think I could add another funnel now without his help. Sigh. I think Zippy would have been a better choice but I just now heard of it inside BSchool group. One more thing, is this theme mobile friendly? I hear darn Google will start de-prioritizing rank for non-mobile friendly sites. My theme apparently doesn’t pass even though it is allegedly “responsive”. Thanks in advance and yes, I am going to try to find some FAQ’s. Love & Peace. I have just signed up for the Zippy Courses but have no real idea as to how I would promote my course or start an email list. Do I need to set up a Facebook page and hope to get traffic that way? Some information as to how to do this may be a valuable blog for people starting out and not knowing what to do? Thank you for your shared information so far! Hi Derek, I’m setting up a new online resource business. Can I use Zippy software to market courses by other trainers as well as me? Is there provision for creating trainer profiles so users could search courses by trainer? Software looks awesome! I definitely agree that free email courses are a great way to build your list. When we launched the How to Become a Morning Person course back in January we received more than 25,000 new subscribers in a 3 week period. The list is now growing at over 1,000 subscribers a week, so we have had to put on additional sessions (with new content based on feedback from earlier students). 1. Nobody wants to go through a course alone. Ask for shares at every touchpoint – Facebook, email and twitter shares all work – to encourage students to invite a friend. Once you have sufficient growth (even just 200+ people), you can consider creating a dedicated community on Facebook so students can encourage each other and keep one another accountable. A well-managed Facebook group is self-sustaining – Facebook’s notifications keep people updated and engaged and inviting more friends is a snap. 2. Offer massive value from the outset. It’s not enough to offer the first few lessons of your paid course for free. Commit to offering a full free experience so that people can get the real experience of being your student/client. If they have a great experience they will become students for life and pricing and referrals will look after themselves. Similarly, you can’t have people just opt-in to your sales funnel and call it an email course. Your content needs to be independently actionable to be valuable. If you have something for sale that complements that value, all the better, but you have to focus on delivering that value up front first. I already bought the ZippyCourses plugin. How do I get the premium landing page? Is that already part of the plugin? I have an existing 30-day sales training course I sell. How well do you think offering the first few days or even a week for free would work? This post is inspiring me to test it but would love your input. I think this is a great idea, and I thank you for sharing it Derek (and Guillermo). It also sounds, alas, like the “next thing” that’s a must do. Really, the next thing to do is to find *your* way of doing things and do it so well that people just can’t help joining your mailing list. That’s what Derek has done and will continue to do. And I suspect this is what Guillermo is doing right now. Hi Guillermo, That’s a very generous idea. Do people who sign up for your e course for free finish the course? And do many of them sign up for your services they must pay for ? I’m curious because many people (myself included) tend to “put off” or procrastinate on doing free courses, even though they are valuable. That said, I love your idea. Keep giving! This is exactly what I’m planning on doing. I created a six lesson video series on Pilates for Better Posture. I bought Zippy courses last November because I knew this is what I wanted to do but I’m a bit slow on the techy side, I need to hire a VA that can help me load everything to Zippy courses and set it up. I know it’s super easy but I’d rather pay an expert and concentrate on Pilates. Anyone out there want a job? Derek. do those of us who’ve already purchased Zippy courses need to upgrade to get the new theme or do we get it automatically. Thanks! Is the course outlined in your sample page picture above available on your site? How do you promote it, in order to get people to opt-in? I’m sure there are persons who can shed some light on what effective process(s) can be employed to this end. P.s. Thanks for all your doing Derek. Everyone says how cool to have a free course and how they build their list from 0 to ++++++ BUT HOW PEOPLE PROMOTE THEIR COURSES?? I think you don’t have to be a brilliant to build a course but you have to be smart to promote it correctly, and if you don’t promote it correctly you wont build a list.. right? I have the same question. How do you list build, promote the page and get followers/customers. Without that, you have wonderful content and courses but nothing else. Anyone have a suggestion or insight in list building? Derek has a lot of great free info about how to get the word out, check out his posts and videos about the drafting technique. What is your niche / topic? Iryna, what’s your Pinterest handle? I’m assuming you’re planning to promote the course through Pinterest as well … Email me a link to your pin: mallory @ missmalaprop.com; I’d be happy to re-pin! Totally windblown! This will revolutionize the way we do marketing! Now still half way done for creating my weight loss program for busy executives and giving my list a free 7 day course will allow them to test try my course. If they like it and it resonates with them, they would buy it. Giving a free online video course would totally upscale the value on free content marketing. I wonder if a class might not be too much for the first contact. I’ve done a PDF Starter Guide and a 3 Part Video Series and I have gotten some feedback that that they were too “involved”. I sign-up for video series etc often so it may just be an indicator that I’m reaching the wrong people. I’m going to implement the free course strategy and refine my targeting this week, I’m anxious to see what happens. Great idea! I have to say, while I don’t speak Spanish, I can sort of read it and as a Canadian, I love that his first course is: Il Invierno en Canada….how do you say the never ending bloody winter in Canada in Spanish?? Do zippy courses work with Squarespace? Am considering purchasing Zippy Course but am hung up by the same question you posed regarding Squarespace. Have invested a lot of time on y site already, hate to have to start over…did you ever get a response? I see there’s a question about integrating with Square Space but I can’t see an answer? SS is what we use. And also the answer about integrating video and audio into training programs. Thanks – I’m finding all of this very helpful. 1. It allows potential clients to go through one of your ‘systems’ to see if it resonates with them. 3. It allows them to try out your skills and knowledge to see if it’s what they need. 4. It also gives them a sneak peek of the quality of the goods and your customer service. 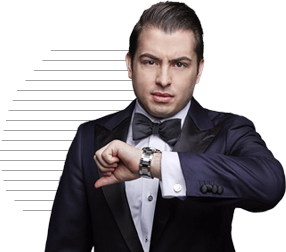 I started my 2nd 6-figure business last summer on ZERO list, I quickly got 400 folks to subscribe for a free course. Over 50% of them converted to the paid course the instant it was ‘live’ and I banked a multiple 5-figures on a list of 400. Win-win. Hi Star, How do I initially build a list? I am just starting out and have no list or a clue as how to build/where to go to build. I’ve just this week finished my first free report as a lead magnet for my coaching business. Online course construction was somethinbg I thought would be in the distant future but this weeks emails and the offer of zippy courses has expedited my plans! It will be great to put it into immediate action and convert my lead magnet content into course format. I think I’ll learn a lot in the process and I know when I buy from people like Derek and Ramit, seeing them ‘in person’ is an important part of it. For me, it builds trust in them, their brand and therefore the product, as it isn’t just a faceless entity. Excited for this and what it can do for my brand-cheers! Absolutely!! I have absolutely converted to paid courses after taking free courses. It’s the easiest way to get someone to see the value you can offer. They also provide you with the opportunity to decide which of your course offerings are the ones your audience most enjoys and focus your efforts. Can it integrate with Squarespace? It sounds as though it only works with WordPress, but I know Jenna Soard uses it and she’s on SS. Also, can I integrate video and audio recordings? You can connect it to Squarespace, with a subdomain! So check this out, get a cheap webhost like Dreamhost… install wordpress (it’s a one click install) … install zippy courses, connect Squarespace and that install with a subdomain “members.yourdomain.com” You can easily create and forward a domain to any web address! Unfortunately, no it doesn’t, Tiffany. I asked and I received an email letting me know that it currently only works with WordPress sites. I agree here. Offering a free training course will help you stand out and it will help you build a good email list for sure! I have thought about doing this too. Now, after reading this, I think I will give it a try! I like the idea of “free courses” as a point of differentiation. I would imagine the value immediately goes up, with just a little work! Hello! Tried to sign up at Zippy Course – but could not! Need to know if this will integrate into my BigCommerce site?? And I’m using it 🙂 Excited to make this a part of my member’s area. Ok. I get the idea. I did something simular too. Offering a free ebook and video course. But, where do you get the traffic from? You still need to invest in some serious backlinks or buy some traffic in order to get opt-ins right? Obviously you want to prevent Google from crawling the lesson content, but you should consider opening up the landing page to Google for extra search juice. The difference is that this course is actually a paid course. It might be better as suggested by Derek! We’ve actually been using free courses as a way to grow our list. In the last month we’ve grown it to over 2,500 people. Best advice I can give, is make sure your course is very specific. Our first course was too general and it overwhelmed people so much that they didn’t even take the course.. So instead of “How To Use Twitter” make a course on “How To Grow Your Twitter For Plumbers” for example. I’m doing something similar. I’ve built a membership library in Zippy Courses and even ran a very cool scavenger hunt through Zippy. Excited to add the course directory so members of the free content library know they can upgrade to paid courses. Lacy, I’m LOVING the fun, engaging personality that practically oozes from your site! Really sets you apart from the rest of the copywriting pack… your “secret agent” days are over, because your secret is out! Lacy, your site is so creative. As my son would say “flick site”. lol. Not sure that’s even the proper way to say that. Very nice! I love your website, how you have intergrated the course into your theme. Plus the theme of ‘mystery’ 50’s style Lacy. The courses look interesting too! Love hearing this Lacy. I’m going to have someone on my team reach out to you ;-). Interesting…how in-depth are these free courses? They can be as in-depth as you want them to be. Heck, you could just make it 3 lessons. Instead of having a 17 page ebook, offer a 3 lesson course, with 5-6 pages of content each lesson. Brilliant. Simply brilliant. I do a few free challenges a year so I can turn these into mini-courses,etc… for opt-in magic. Hmmmm. Will explore this fo’ sho’. Derek, this is great! 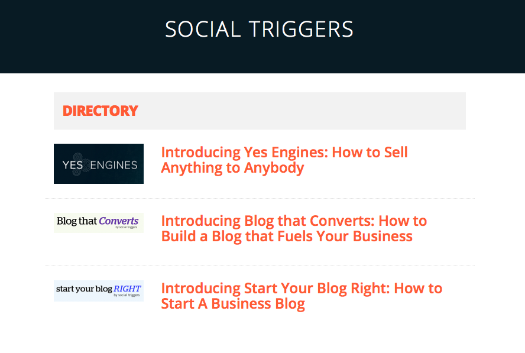 Hi Derek, thanks for featuring my site in Social Triggers. It’s been a pleasure helping you and the development team during the beta phase of Zippy. Hi Guillermo, I’m excited to see you using Zippy Courses this way – smart man! I’ve done my own custom version of this in the past, although a lot more raw looking. Even then, back in 2012 I was able to add over 100 subscribers in 30 days to a brand new blog by giving away a 4 day course. Glad to hear it Gabe. I’m excited to try it myself.